A court filing Monday officially revealed, after a mediator lifted a gag order, that under a deal announced in June San Bernardino has begun repaying skipped CalPERS payments ($13.5 million plus fees and interest) and will not cut pensions in bankruptcy. Stockton did not want to cut pensions, saying they are needed to be competitive in the job market. But a federal judge ruled in the Stockton case that CalPERS pensions can be cut in bankruptcy, where federal law prevails over state attempts to protect pensions. While preserving pensions, the Stockton plan cut bond debt and eliminated retiree health care, replacing a $545 million long-term debt with a $5 million lump sum. A holdout, Franklin bonds, appealed the approval of the Stockton exit plan last month. Vallejo exited bankruptcy three years ago with a similar plan that cut bond debt and retiree health care. City council members said later they did not try to cut pensions because CalPERS threatened a long and costly legal battle. Retiree health care debt was often ignored until a change in accounting rules a decade ago. A state Supreme Court decision in 2011 said retiree health care can be an “implied contract” with vested rights, protected much like a pensions. Many employers do not make pension-like investments each year to help pay for retiree health care promised in the future. Last year the state worker retiree health care unfunded liability, $64.6 billion, was larger than the state worker CalPERS unfunded liability, $49.9 billion. A status report filed by San Bernardino earlier this month said closed-door talks with a committee representing “several thousand retired city employees” would be a “huge step forward” if an agreement can be reached. “Just recently, the city and the retiree committee reached a tentative agreement regarding modifications to retiree health benefits, contingent upon the parties reaching an overall agreement on plan treatment of retiree claims,” said the city filing. In Stockton, part of the retiree committee agreement to accept the elimination of retiree health care was a promise from the city that retiree pensions would not be cut in the bankruptcy. The San Bernardino city council voted 6-to-1 Monday to award a $300,000 contract to Management Partners, which under the direction of Deis worked on the Stockton “plan of adjustment” to cut debt and exit bankruptcy. Deis retired as the Stockton city manager last November and joined Management Partners in May. The consulting firm worked with San Bernardino from 2007 to 2011, making a large number of recommendations, only a third of which were enacted. Stockton had a structured bankruptcy that began with a 90-day mediation with creditors under a new state law. The attempt to avoid bankruptcy failed, and the city filed on June 28, 2012. San Bernardino made an emergency bankruptcy filing Aug. 1, 2012, seeking immediate debt protection to continue making payroll. The long-troubled city has had political in-fighting, changing demographics and a sagging local economy. San Bernardino lost the “cornerstone” of its “plan of adjustment” this month when voters rejected a proposal to end automatic pay raises for police and firefighters, which are linked to the average pay in 10 other cities, said the city’s status filing on Nov. 5. Measure Q would have removed a city charter provision requiring the pay link to other similar-size cities, replacing automatic raises with collective bargaining. The measure was rejected by a vote of 55 to 45 percent. U.S. Bankruptcy Judge Meredith Jury criticized the city this week for assuming voter approval of the measure as part of its plan, the San Bernardino Sun reported. The judge set a May 30 deadline for submitting a plan of adjustment. Police and firefighter unions and the biggest bondholder wanted a March 1 deadline. The city’s agreement with CalPERS called for a plan no later than Sept. 1 next year. The city owes more than $45 million on unsecured pension obligation bonds, not backed by collateral to protect against default. Smaller bond debts are both secured: lease revenue bonds $7 million, and certificates of participation $8.5 million. Pension obligation bonds are usually issued to reduce an employer’s annual payments to the pension fund, CalPERS in this case. If the pension fund investments earn more than the interest on the bonds, the employer can make a profit. Employers also can lose. Stockton issued $125 million in pension bonds in 2007, the same year the CalPERS pension investment fund began a historic plunge, dropping from $260 billion to $160 billion in 2009 before climbing to $298 billion this week. San Bernardino has not been making a $500,000 annual payment owed to Public Agency Retirement Services, a private firm that has sold customized supplemental pensions to dozens of California cities. PARS is not mentioned in the city status report. The city reached a tentative agreement with the police union in August, which was approved by the city council and the union membership, said the city status report. The union accused the city of misinterpreting the agreement and revoked it. An item pulled from the city council agenda Monday would have authorized a request for a proposal from the San Bernardino County Sheriff’s Department to provide law enforcement services for the city. In September, the judge allowed the city to overturn its firefighter union contract, a ruling appealed by the union. The city imposed a new contract that closed a fire station and made cost-cutting staffing changes. Voters in Stockton approved a ¾-cent sales tax increase, and Vallejo voters approved a 1-cent tax increase. The status report said that any San Bernardino tax increase is not likely to go before voters until next November. “Even then, consideration of a revenue measure by the city and its citizens may be problematic given that the city remains the poorest municipality in the state,” said the status report. At a public bankruptcy update last month, San Bernardino officials said city retirement costs are expected to double during the next 10 years. 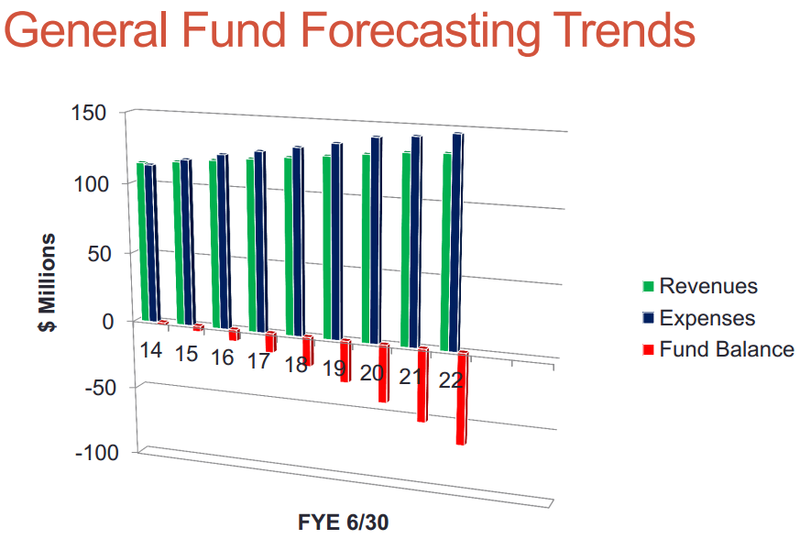 And during the next eight years, general fund expenses are projected to grow faster than revenue. This entry was posted on November 20, 2014 at 8:30 am and is filed under Bankruptcy, San Bernardino. You can follow any responses to this entry through the RSS 2.0 feed. You can skip to the end and leave a response. Pinging is currently not allowed. You mentioned that in 2011 the Ca. Supreme court ruled an advisory opinion that vested health care benefits theoretically could be implied. After trial, in 2014 the 9th Cir. Ct. of Appeals upheld the trial courts ruling in the case; the union had not proved the “legislative” intent from which such a vested right could be implied. Vested rights require a legislative(Charter, Ordinance)intent, whether for pensions or other claims. If Stockton can stiff $2 billion in creditors, that should be the business model for every municipality. Why should anyone think debt should be repayed? It can be rolled over or canceled. We can get so efficent at bankruptcy that every govt entity goes through every it every few years. Put that into the five year planning cycle. Spend like crazy years 1 through 4, go bankrupt in year 5,,,start over. Mr. Mills: In order to file a Chapter 9, a city needs a lot of money. In the initial bankruptcy, the cost is borne by the bond holders by non-payment of annual costs and then wiping them out. But there is no money for a second bankruptcy until new bonds are issued. According to the city of Stockton, the bankruptcy cost about $43M. It was paid by terminating medical benefits and bond payments. But the enormous pension debt remains, growing at 7.5% per year. So taxes, taxes, taxes. A common sense parcel tax deemed “bankruptcy fees” will work. And the beat goes on in Stockton, a councilman(Fant) was arreted for DUI(more than double legal limt) just after interviews nationally as emblematic of someone to to take the city forward. Another councilwomanFugazi) arrested similarlyand claiims police are fter her for not supporting their desire for more you know what. Deis retired and made it sound he would do something different. Judge Klein will be annoyed because the city will be bankrupt in 2 to five years again. I wouldn be surprised if Deis works for Calpers under the table….no matter how inapproprate that is. Forget the tailored suits(Fant), the perfect hair(Deis). They fool the voters, they fool the media. And then it all tumbles down and they are very good at hiding.